UFO SIGHTINGS DAILY: Ancient Martian Soldier Found On Mars In NASA Photo, Nov 2016, Video, UFO Sighting News. 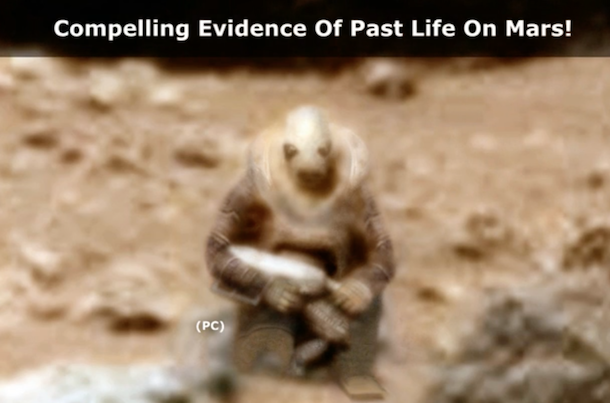 Ancient Martian Soldier Found On Mars In NASA Photo, Nov 2016, Video, UFO Sighting News. This statue was found by Paranormal Crucible of Youtube this week, and its a bipedal species that has on a uniform. The alien is wearing a suit and carrying some weapon of sorts. The most important question is, is it a statue, or was this person petrified (turned to stone) by a gruesome, yet powerful weapon? Intriguing object which I spotted while going through the NASA archives. This one definitely looks artificial in nature and in my opinion is an ancient statuette. The odd thing about this one is that it does resemble an alien grey or possibly an insect type species of alien. I have processed and colorized this object in an effort to bring out all the details that I believe are there in the raw image, the only thing I have added is a foot, some of which is there in the original image but almost impossible to make out. Paranormal Crucible.